The surgery is typically by doctors who perform 100 or fewer procedures annually, done mainly with robotic technology introduced in 2000 by Sunnyvale, California- based Intuitive Surgical. According to the study, the surgeons needed to perform more than 1,600 operations before they were able to gauge with at least 90 percent accuracy how much tissue surrounding the tumor they needed to remove to get all the malignant cells. Leaving stray cancerous cells in the margins, at the edge of the tissue removed during surgery, can lead to recurrences of the disease. 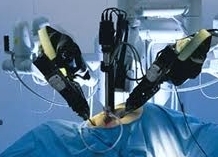 Intuitive Surgical Inc., which manufactures Da Vinci, promotes the robot’s treatment of bladder, colorectal, gynecologic, kidney, prostate and throat cancers, and also marketed for coronary artery disease, endometriosis and obesity. Lawsuits are being filed, alleging tears and burns to blood vessels, intestines and reproductive organs, complicated by the fact that problems generally aren’t apparent until after surgery, resulting in delayed treatment.